This Andre Agassi Biography is of the former world number one professional tennis player Andre Agassi from America. Agassi is only one of three males players to win all four Grand Slam Tournaments to achieve a Career Grand Slam since the beginning of the Open Era. The other two are Roger Federer and Rod Laver. The Andre Agassi Biography includes eight Grand Slam Singles Tournaments in total (4 Australian Open, 1 French Open, 1 Wimbledon, 2 US Open). In addition to winning all four Grand Slam Tournaments Agassi also won the Olympic Gold Medal for singles giving him a Career Golden Slam. He is the only male player to achieve this unique feat. The Andre Agassi Biography is one of an enormously talented striker of the tennis ball who starts out as a ‘rebel’ but goes on to become one of the most humble and admired role models of the sport committed to charitable work. The Andre Agassi Biography begins with his birth on April 29, 1970, in Las Vegas, Nevada, to Emmanuel ‘Mike’ Agassi and Elizabeth ‘Betty’ Agassi. His father is an Iranian who represented Iran in boxing at the 1948 and 1952 Olympic Games before migrating to the US. Andre dated famed American singer Barbra Streisand in the early 1990s. He got married to Brooke Shields on April 19, 1997. Andre later filed for divorce which was granted on April 9, 1999. At the 1999 French Open Tournament Andre Agassi won the Men’s Singles Championship and Steffi Graf won the Women’s Single’s Championship and they danced together at the traditional Champions’ Dance. After the event they began dating. They got married on October 22, 2001. The couple has a son, Jaden Gil (born October 26, 2001), and a daughter, Jaz Elle (born October 3, 2003). They live in the Las Vegas area and own several vacation homes. Agassi turned pro at age 16 in 1986. He ended his first year ranked 91 in the World. In the Andre Agassi Biography we note that as a young player Agassi embraced a rebel image. He grew his hair to his waist, wore an earring and colorful shirts. He chose not to play the Australian Open for the first eight years of his career although this Grand Slam eventually became his best Grand Slam event. Agassi also did not play Wimbledon from 1988 to 1990 stating that he did not wish to participate because of the ‘predominantly white’ dress that players had to wear. In 1990, Agassi helped the United States win the Davis Cup and won his only ATP Tour World Championship. Agassi won his first Grand Slam at the 1992 Wimbledon Tournament. He beat Goran Ivanisevic in a five set final. He also helped the US win the Davis Cup Tournament. In 1994 Agassi had a new coach, Brad Gilbert. Andre started to employ a more tactical consistent approach to his game which fueled his comeback from a poor year in 1993. He became the first man to win the US Open as an unseeded player beating Michael Stich in the final. 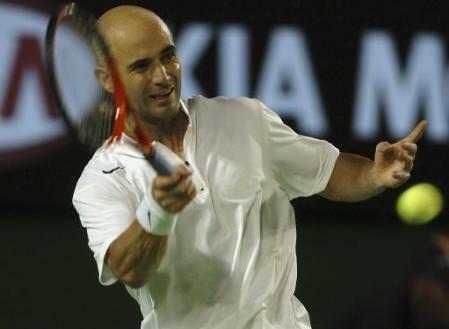 Agassi shaved his balding head in 1995 breaking his ‘image is everything’ style. He played the Australian Open for the first time and won it beating Pete Sampras in the final. Agassi won three Masters Series events (Cincinnati, Key Biscayne, and the Canadian Open). He reached World Number 1 ranking for the first time in April 1995. He held the number 1 rank for 30 weeks. Andre was part of the US Davis Cup wining team for the third time. Andre won the Men’s Singles Gold Medal at the 1996 Olympic Games in Atlanta beating Sergi Bruguera of Spain in the final. He also defended his titles in Cincinnati and Key Biscayne Masters Series events. 1997 was a low point in Agassi’s career. He won no top-level title and his ranking went down to 141 in the World on November 10, 1997. In 1998, Agassi re-dedicated himself to tennis. He started a rigorous conditioning program. The one time ‘rebel’ became a gracious and thoughtful athlete. He bowed and blew two-handed kisses to spectators on each side of the court after winning a match, a gesture seen as a humble acknowledgement of their support for him and for tennis. Andre won five titles to leap from World Number 122 at the start of the year to 6 at the end, making it the highest climb into the top 10 made by any player during a single calendar year. One of the high points in the Andre Agassi biography is when Agassi entered the history books in 1999 when he won the French Open beating Andrei Medvedev in a five set final to become only the third player in the Open Era (others being Rod Laver and Roger Federer) to win all four Grand Slam Tournaments during his career. He won the US Open beating Todd Martin in a five set final. Agassi finished 1999 as the World Number 1 ranked player. This was the only time that he finished the year as the World Number 1 player. 2000 was the second year that Andre won the Australian Open tile beating Yevgeny Kafelnikov in a four-set final. Agassi reached the semifinals of Wimbledon losing to Patrick Rafter in five sets in match a considered by some to be one of the best ever played at Wimbledon. In 2001 Agassi defended his Australian Open title beating Arnaud Clement in the finals in straight sets. Andre finished the year as the World Number three ranked player becoming the only male player to finish the year ranked in the top 10 in three different decades. Andre won the Masters Series Tournaments in Key Biscayne, Rome and Madrid in 2002. He finished 2002 as the oldest year-end World Number 2 at 32 years and 8 months. Agassi won his eight and final Grand Slam Tournament at the 2003 Australian Open beating Rainer Schuttler in straight sets in the final. He won his sixth career and third consecutive Key Biscayne title becoming the youngest (at 19) and oldest (at 32) winner of this event. On April 28, 2003, at 33 years and 13 days, Agassi captured the World Number 1 ranking to become the oldest top ranked player since the ATP ranking began. In 2004, at age 34 Agassi won the Masters Series event in Cincinnati to achieve a record 17 Masters Series titles. One of the highlights in the Andre Agassi Biography is when Andre did an improbable run to the US Open finals in 2005. In the quarterfinals he rallied from two sets down to beat James Blake 7-6 in the fifth and final set. Agassi lost to Federer in four sets in the final. Andre finished the year ranked Number 7 in the World, his 16th time in the year-end top 10, a record which equaled Jimmy Connors for the most times ranked in the top 10 at year-end. Agassi had a short but dramatic run in his final US Open in 2006. Because of extreme back pain he had to receive anti-inflammatory injections after every match. Agassi’s last match was the 3rd round of the US Open. He was in obvious pain during the match in which he lost to 112th ranked Benjamin Becker of Germany in four sets. After the match Agassi received an eight minute standing ovation from the crowed and delivered a memorable retirement speech. Andre earned more than US $30 million in price money during his career, third only to Pete Sampras and Roger Federer (as of August 2009). He is said to have earned over US $25 million a year through endorsements during his career the highest by any tennis player. After retirement Agassi continues to participate in charity Tournaments and play World Team Tennis for the Philadelphia Freedoms. The playing style part of the Andre Agassi Biography is that of a player that had an aggressive baseline game. What made him different is his short backswing and extraordinary hand-eye coordination that enabled him to hit the ball very early. These attributes also made him one of the best returners of serve, if not the best, to play the game of tennis. Agassi was known for his ability to dictate play from the center of the baseline, hitting sharp angled winners when he got the chance. Andre Agassi Biography should state that Agassi’s serve and net game were not impressive. His serve got better as his career progressed. The Andre Agassi's Biography is not complete without mentioning his numerous philanthropic work. Agassi maybe the most generous athlete of his generation. In 1994 Agassi launched the Andre Agassi Foundation to help disadvantaged youth in the US. In 1995 he was awarded the ATP Arthur Ashe Humanitarian award for his efforts to help disadvantaged youth. In 1997 the Foundation built a 25,000 square-foot Boys and Girls club that help about 2,000 children each year by providing models of physical, educational and social growth. 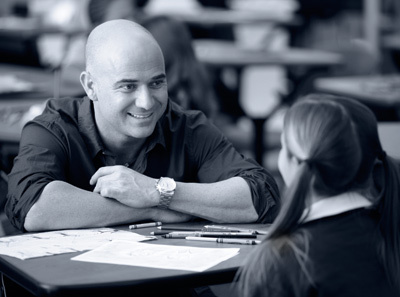 In 2001, the Foundation opened the Andre Agassi College Preparatory Academy - a K-12 public charter school conceived on the belief that nothing has a greater impact on a child’s life than the education he or she receives. The Andre Agassi Biography continuous to be written as The Andre Agassi Foundation continuous to help disadvantaged youth through many other programs. The Andre Agassi Biography includes several records. Only male player to achieve a Career Golden Slam. Only the 3rd male player (others being Rod Laver and Roger Federer) in the Open Era to achieve a career Grand Slam. Most number of career ATP Masters Series Titles at 17. The oldest top ranked player since the ATP ranking began, at 33 years and 13 days. Only male player to win 4 Australian Open Championships (1995 to 2003). The only male player to finish the year ranked in the top 10 in three different decades. The most number of consecutive wins for a male player at the Australian Open at 26 from 2000 to 2004. Andre Agassi Biography includes Andre being the first male player (of two, the second being Roger Federer) to win all four Grand Slam tournaments in three surfaces (clay, grass, hard). The player to win the most number of different Masters Series Tournaments winning 7 out of the 9 Tournaments. He has not won in Monte Carlo and Hamburg. Tied with Jimmy Connors at 16 times for the most number of years ranked in the top ten at year-end.